It is made of polytetrafluoroethylene (PTFE). The patented design utilizes mouldeling, self-sealing mechanism, no O-ring is inside therefore cross-contamination is eliminated. 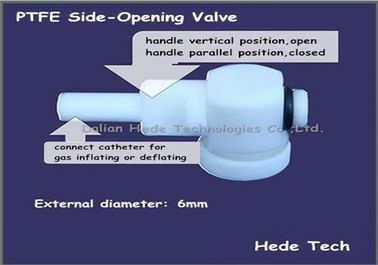 The connector of PTFE valve is parallel to the bag film. The difference to PTFE valve is that it does not have sampling cap. It can handle gases that there is not corrosive to PTFE. The valve can be used in VOCs analysis.